Ground floor unit. A king bed and a single bed in the lounge with full kitchen facilities. 50+ sky channels. Ground floor 2 bedrooms family unit. A queen bed in one room, 3 single beds in other room. Sofas and TV in the lounge (can add 2 single beds if need). Full kitchen facility. Ground floor unit.. A queen and a single bed in the lounge with tea/coffee/toaster/microwave facilities . beds in the bedroom. With full kitchen facilities. 50+ sky channels. 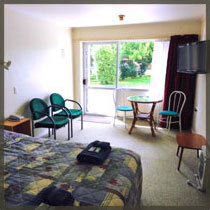 Cambrian Lodge Motel has a range of units from a queen bed studio with tea/coffee/toaster/microwave facilities up to family units with full kitchen facilities. We offer continental breakfast and have a wide range of facilities including; ample off-street parking, swimming pool, private spa pool, barbecue and guest laundry. All units have free wireless internet. 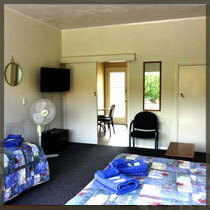 All units have a 32’’ flat screen TV with 50+ sky channels. Full kitchen units have ironing facilities and hair dryer. The Cambrian is only 15km from the Hamilton International Airport and an easy 4-minute walk to the town centre of Cambridge to supermarkets, restaurants, cafes and shops. We are also handy to 6 golf courses, Mystery Creek and Lake Karapiro. 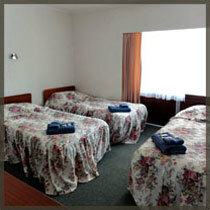 Less than a 2-hour drive away from Auckland, Coromandel, Tauranga Taupo, Rotorua, and Waitomo Caves the Cambrian Motel Lodge is ideally located accommodation. Cambridge itself has many fine restaurants to choose from as well as art, crafts or antique boutiques to browse through. On Hamilton Road 300 metres from St Andrews church towards Hamilton on the left. If cancellations are made less than 24 hours from the booking date, a fee of one days stay will be charged.